Every two years IBBY Congress travels to a different country; England, Mexico, New Zealand are some previous destinations. This summer Greece was calling, with the theme East meets West around children’s books and fairy tales. As a proud Greek who lives in the UK and a member of the IBBY UK committee, I could not have missed this year’s congress, the crossroad between East and West, and between my personal North and South. Philoxenia literally means “love for the foreign/ the different” and sums up very well the essence of this congress. 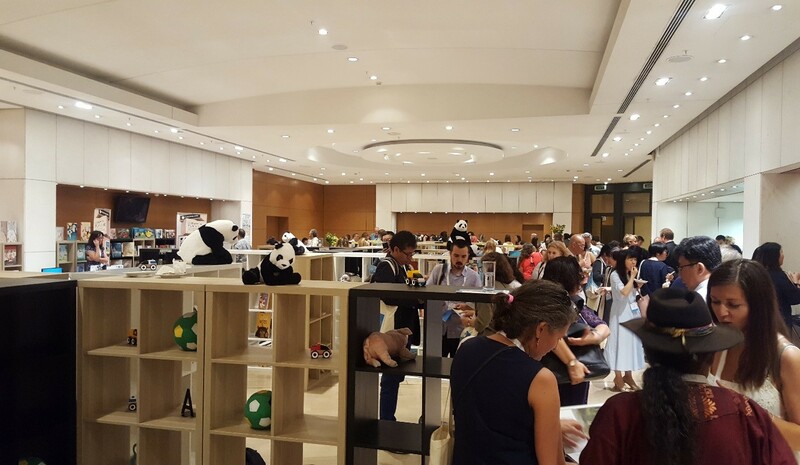 Athens, Unesco World Book Capital 2018, blessed with a lovely sunny weather and an incomparable cultural heritage, welcomed hundreds of delegates at its Concert Hall. Not only did the participants come from all over the world, but also the topics they discussed highlighted the spirit of philoxenia: embracing diversity and bridging different cultures. 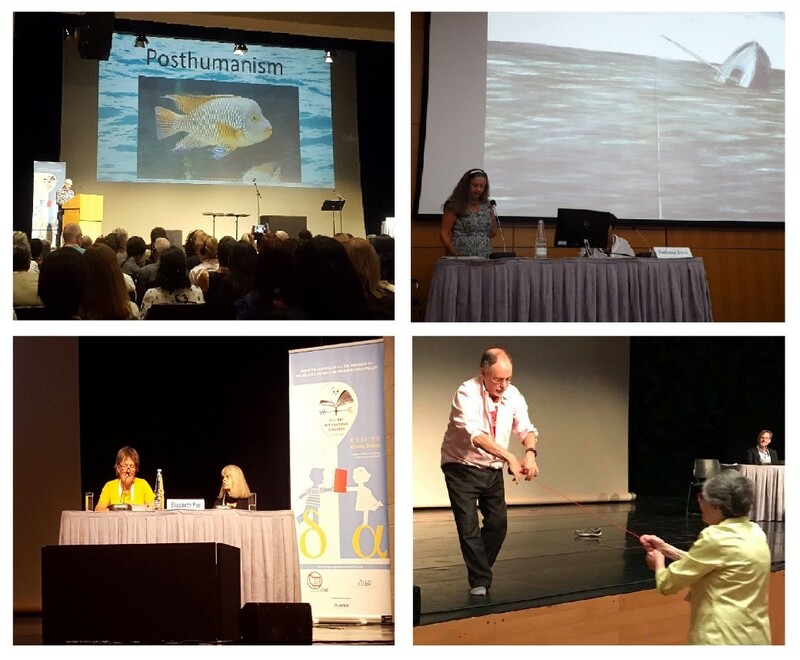 After Perry Nodelman’s presentation, I see fish in a different –posthuman– perspective. Perry discussed children’s books with human-like fish protagonists. In his own words, the relationships between people and fish “might offer useful insights into the congress focus on difference, sameness, and diversity in exclusively human nations and cultures”. Drawing on her own books, Deborah Ellis talked about how teachers can make a difference in students’ lives, especially when those students have experienced unfortunate situations such as migration or disabilities. With his “portion of light”, Gregory Maguire wrote stories. On the stage of Athens Concert Hall, he narrated one of his most captivating fairy tales, except that it was his adventurous real-life story. Janet Evans shared Armin Greder’s wordless picturebooks “The Mediterranean” and the responses of 9-10-year-old children who read the story with her. Xavier Miguez invited us to have a look at how cultural diversity is represented in Spanish and Latin American picturebooks. Julia Hope explored children’s responses to the refugee experience as demonstrated in Beverley Naidoo’s “The Other Side of Truth”. Petros Panaou and Tasoula Tsilimeni compared book covers with the covers of their translated versions, making us wonder: could we judge a culture from the publishers’ choices. 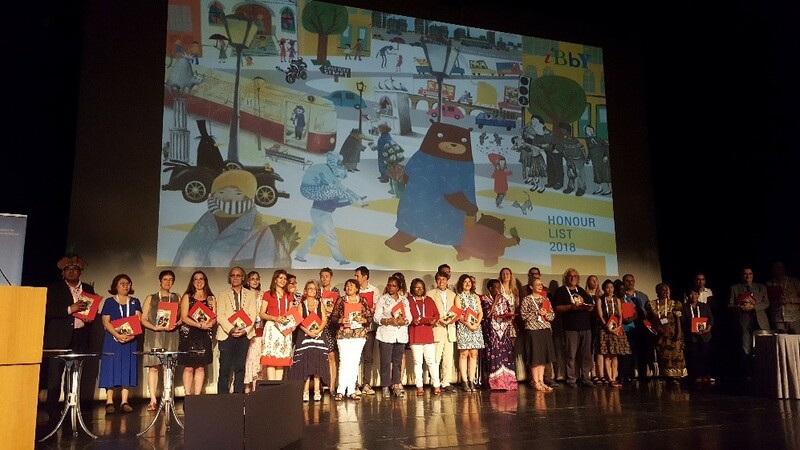 Other moments to remember from IBBY Congress 2018 were the Asahi Reading Promotion Awards and the Hans Kristian Andersen ceremony. For the former, the winning project is Les Doigts Qui Rêvent (Reading fingers) and for the latter, Eiko Kadono from Japan and Igor Oleynikov from Russia are awarded as the best author and illustrator respectively. In the IBBY Honour List session, many talented artists were called to the stage to receive their awards, applauded by the excited audience of the Banqueting hall. The congress ended with a… traditional dance, like almost all Greek celebrations. I feel grateful I attended the 36th IBBY Congress, because I could see that all the participants, the organising committee, the volunteers, the delegates, the teachers, the students, the authors, the illustrators, the publishers, the librarians that were there put something of themselves into the congress. There is an untranslatable Greek word for it: meraki. This congress was made with a lot of meraki, soul, creativity and love. Looking forward to the 37th IBBY Congress in Moscow, Russia on 5-7 September 2020, with the theme Great big world through children's books.